BEFORE: A bit of a switch-up in the schedule today. I originally had Crash scheduled after the two superhero movies, but I realized it connects nicely to yesterday’s Capote. 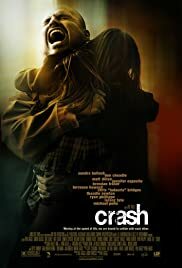 Both were nominated for Best Picture in 2005 and Crash won the Oscar. And I can also squeeze in another 2005 Best Picture nominee, Brokeback Mountain in tomorrow. That will leave me at with just Good Night, and Good Luck is on my list, of 2005 Best Picture noms. AFTER: Whites, Blacks, Mexicans, Hispanics, Asians, and pretty much every other race is represented in Crash. And let me tell you, it’s not always in the best light. In the beginning, there are quite a few derogatory remarks and I found them comical. It appeared the the director Paul Haggis was using stereotypes for comedic effect rather than dramatic. But by the end of the film, it is the complete opposite. There is nothing funny about the racial remarks; it is all business. Stereotypes are made on all sides of the spectrum here. The whites don’t trust the blacks, hispanics… pretty much any non-white person. But you also have the minorities stereotyping whites as racist, unsympathetic monsters. Everyone has something to relate to here. Theme is something I don’t mention in these reviews a lot because I don’t find it all that important. To me theme is one of those things that critics and snobs try to force upon media to give it meaning. Every tiny detail does not need to be somehow related to the filmmaker’s intent. Sometimes the actor is in the left of the frame just because; there isn’t always a purpose. It can be a useful tool for analyzing something but for the most part, I find it takes away enjoyment from other elements like characters, dialogue, actions, etc. Crash is a great counter-example because not only does it make the theme blatantly obvious instead of hidden and subjective, but it’s also highly relatable. Crash also succeeds at story as well. It’s very difficult to make interweaving narratives work. Most of the time, it feels disjointed and unfulfilled at the end when all the individual stories come together. While the film felt slightly disjointed at the beginning, it quickly gained a sense of direction and by the end, everything made sense. You’re sure to recognize at least one actor in this large ensemble cast. And whoever you are, regardless of race, gender, or ethnicity, there will be some part of Crash that you can relate.